Grilled corn on a plate with garnish. 4 How Long Do Ears of Corn Take to Roast in a Campfire? 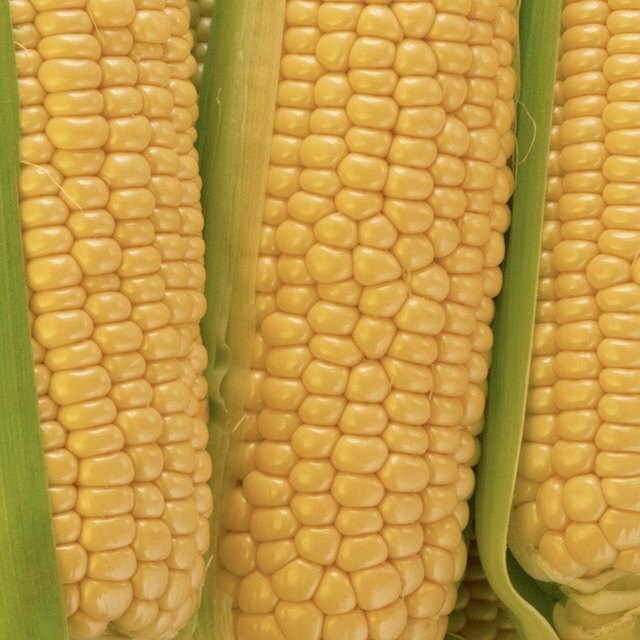 Neither pouring rain nor limited grill space should prevent you from grilling ears of corn. A traditional outdoor grill cooks food with a single, direct heat source. Grilling corn in a conventional oven requires refocusing the heat around the entire ear. 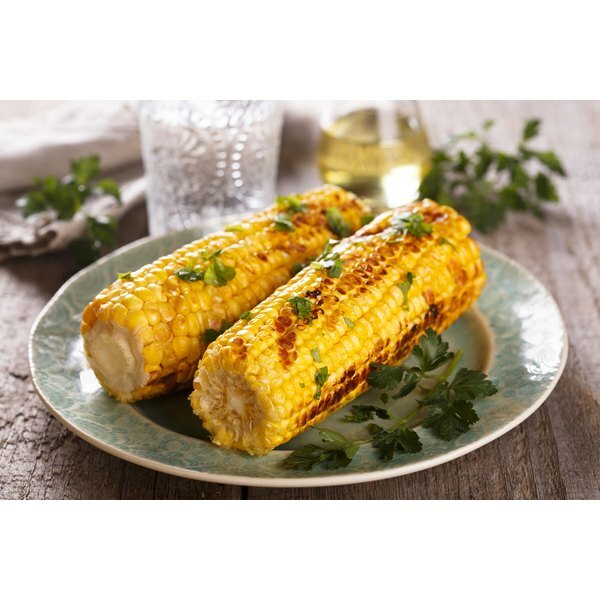 The sweeter varieties of corn grill best because the sweetness offsets the mild, smoky flavor from grilling. Not only does grilling corn in your oven let you enjoy barbecued meals year-round, but it also lets you save the outdoor grill space for meat and other vegetables during the summer months. Anyone who’s ever eaten poorly washed ears of grilled corn knows the unpleasant taste of charred dirt. Washing dirt off the husks with warm water and removing any brown silk prevents the heat from infusing the corn with any undesirable flavors. Clean husks protect the corn kernels from charring or burning inside the oven. Spreading a mixture of butter, salt and pepper under the husks allows your corn to channel heat without burning the kernels. Gently pull each husk down as far as possible without permanently separating it from the ear. Use a basting knife to slather the exposed kernels with butter and spices. Return the husks to their original positions covering the kernels before placing the ear of corn inside the oven. The temperature inside the oven should mirror low heat on a traditional grill -- approximately 350 to 400 degrees Fahrenheit. Place the ears of corn in a row on the top oven rack. Cooking the corn directly on the rack, without a glass dish or baking sheet to buffer the heat, lets the kernels absorb that fire-grilled flavor through the husks. Rotate the corn every 10 minutes for a total cooking time of 30 minutes. After grilling your corn in the oven for 30 minutes, you have two choices. The first option is to peel down the husks and serve the uniformly golden ears of corn. The second option is to remove the husks and apply a second, thin layer of seasoned butter. Then, instead of serving the corn, return the bare ears to the heated oven for another six to eight minutes. Without protective husks the corn burns easily, so stand by the oven and rotate the bare ears of corn 1 inch forward, approximately every two minutes until the kernels begin browning. Can You Dehydrate Sweet Corn?